Codium fragile ssp. tomentosoides from Caribou Harbour, an estuarine site in the southern Gulf of St. Lawrence, was extremely tolerant to stresses from desiccation and reduced salinity. Photosynthetic responses of both rhizomatous and erect growth forms were measured using pulse amplitude modulation (PAM) fluorometry of chlorophyll a fluorescence to determine effective quantum yield (ΦPSII) and relative electron transport rate (rETR). After 5 h of desiccation, thalli lost 20% of their mass, but still showed high levels of ΦPSII. Thalli survived for at least 6 h in freshwater, and showed virtually complete recovery of photosynthetic capacity within a few hours of return to full seawater. Immersion in 8 psu showed virtually complete recovery until the 24 h treatment period. Combining desiccation and salinity stresses produced a synergistic effect, but plants still showed strong recovery even after 86% dehydration and reimmersion in 16 psu. 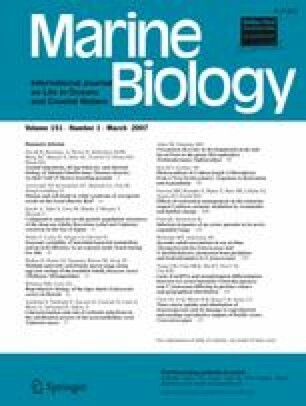 These results suggest that the photosynthetic physiology of Codium fragile is highly adapted to growth in estuarine conditions. Communicated by M. Kühl, Helsingør. We thank Sarah Fraser for technical support and AG Miller and Ricardo Scrosati for helpful discussion and comments on the manuscript. This work was supported by grants from MarineBio21, Ministry of Maritime Affairs and Fisheries, Korea to KYK and the Natural Sciences and Engineering Research Council of Canada to DJG.